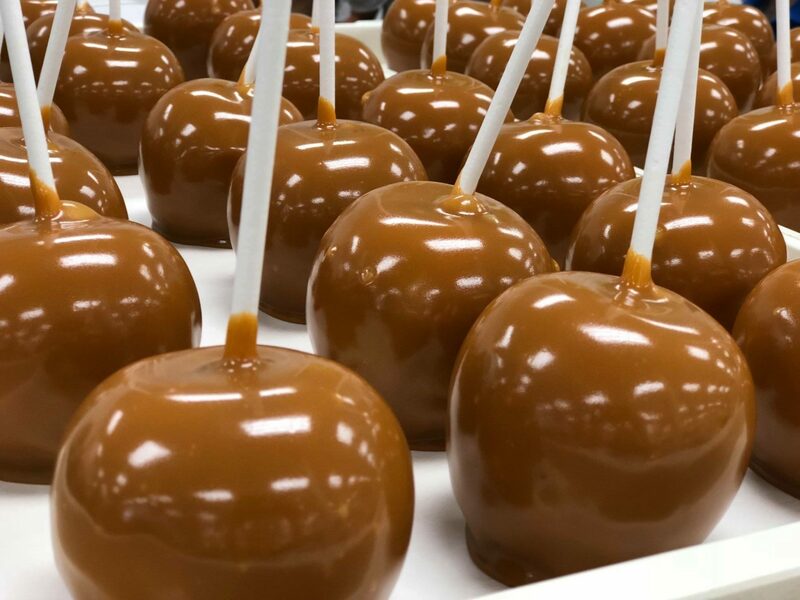 With roots dating back to the 1950s, caramel-dipped apples have become and established and time-honored tradition during the fall holidays. They can also prove to be more of a trick than a treat for those indulging in the specialty creation. For help mastering your festive staple using Peter’s Caramel, follow the below instructions and tips. Wash apples in warm water to remove any wax. Dry thoroughly. Place caramel in microwave-safe bowl. Cook on 50% power for 1 minute. Stir again. Repeat at 50% until thoroughly melted, being careful to avoid scorching. Temperature of caramel should reach 180°-190°F for full melt. Add 1 lb. white confectionery wafers to 5 lbs. Peter’s Caramel to help further resist cold flow and run. Maintain caramel in the 160°-180° range, stirring sparingly to minimize air bubbles. Completely coat the apple with caramel, including pierce point, to obtain maximum shelf life. Allow excess to drip back into bowl. Once you have coated the apple, scrape the excess off the bottom. Flip the apple upside down for a moment to help cool. Place apple, stick up, on parchment paper. If applying toppings that stick to the apple, such as peanuts, sprinkles, or candy pieces, apply immediately while caramel is still warm. For fastest setup and to minimize “feet”, refrigerate apples after dipping for 10-15 minutes. Avoid prolonged refrigeration to prevent condensation.